Declan Kidney announced a 32-strong Irish squad yesterday for the opening match of the Six Nations against Wales. ‘”I could have showboated at the start — the easier thing for me to do would have been to name the squad I named today two weeks ago. That would have been looking after myself, but I wanted to look after the Wolfhounds,” he said. Complicated webs and all that from Declan Kidney in today’s Indo. Worth a read. This entry was posted in News and tagged Ireland, Saint Declan, Six Nations by dementedmole. Bookmark the permalink. People would have less of a beef with Kidney if he said these things when he was asked them first time around – it’s honest, and it makes sense. I’m not sure he needs to be so ‘smoke and dagger’ about his decision making. What does it really get him in the long run? A much better reflection of Irish rugby as She lays en ce moment. Agree with you (again) about thinking behind announcing an enlarged (bloated?) 73 man, 3 squad announcement but with Ref (Gaffers) gone I am genuinely excited about the Irish backline. 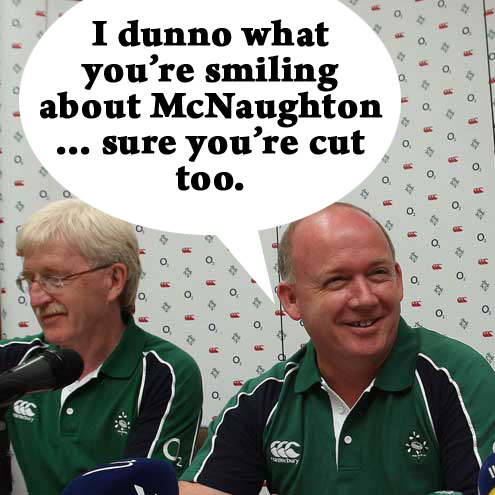 And as blasphemous as it sounds, the prospect of a new Irish 13 is raising good questions of this side. The Special Interest group of which I may have mentioned, along with some particularly “interested” cattle farmers of an Ulster persuasion, have parked some side-projects for now.